During high season (the summer), check in is no earlier than 4 pm on Saturday, and check out is no later than 11 am on Saturday. 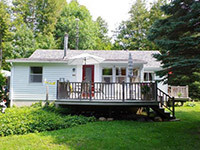 Casa Sol is a beautiful, clean, well-maintained cottage with many features that make time spent there truly special and relaxing. We hope that everyone who visits Casa So experiences all the joys and cherished moments of a special family vacation. 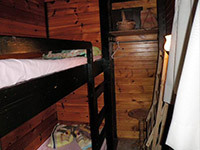 The bedrooms have closets, extra pillows and blankets for those chilly nights. 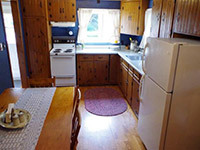 The eat-in kitchen has fridge, stove, microwave, toaster and coffeemaker. There is plenty of room for food preparation and sharing with lots of counter space and a large kitchen table. 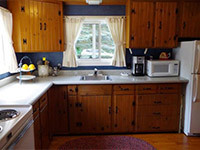 It is stocked with kitchen and barbeque utensils, cookware and serving ware, dishes, cutlery and kitchen linens. The L-shaped living room with windows on all sides has lots of seating, and is perfect for accommodating a large group, or two smaller groups with different activities. A selection of books and board games for all ages is there for those who would like to take a chance and leave their own at home. 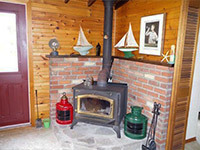 A wood stove at the centre of the living room provides warmth and cosiness when needed. 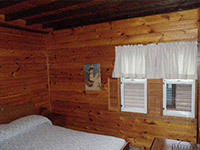 Casa Sol has a washing machine, dryer, microwave, television and DVD player. There is plenty of indoor and outdoor seating and good light for reading, crafts and games. Casa Sol is on a sewer system (no septic challenges!) and there is weekly garbage and recycling pick up. We want your relaxation to start before you get to Casa Sol so we minimize the amount of “stuff” you need to bring with you. 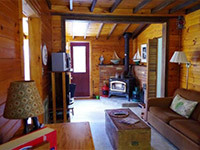 The interior of the cottage is fully equipped, you only need to bring your own bed linens, towels and toiletries. We provide propane for the BBQ, wood for the woodstove in winter, liquid dish soap, soap for the dishwasher and kitchen linens. All amenities are on a single floor so those with mobility challenges will find their stay easy. Casa Sol is cosy for the single or couple, but spacious enough to accommodate a large family. Casa Sol has lots of outdoor living space, to take advantage of everything the summer has to offer. There is a large wrap around deck with a table and seating, as well as the barbeque. There is a large open yard with a firepit, perfect for badminton and soccer.